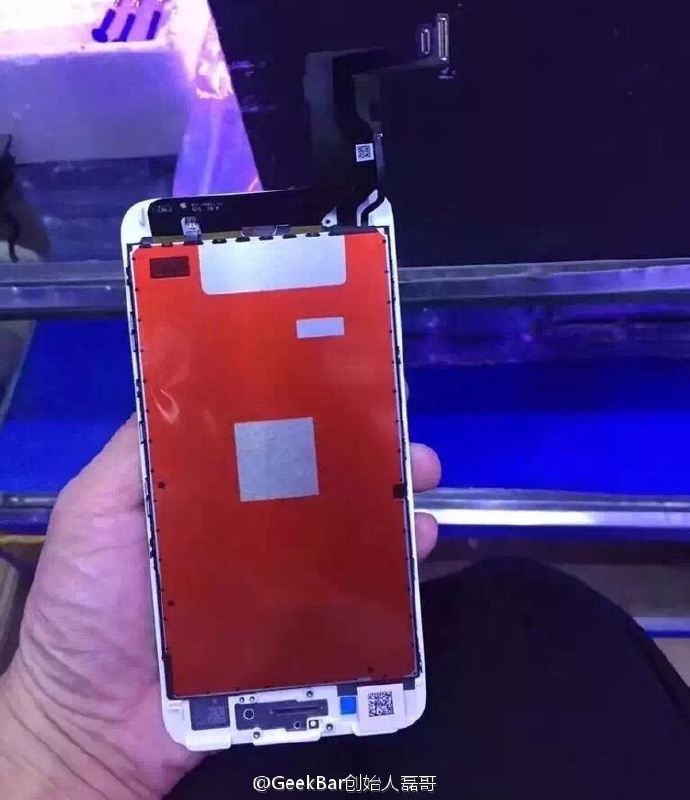 Mobile phone repair firm GeekBar continues to share photos of iPhone 7 components on its Weibo page, with the latest set showing off the display assembly for the device. One photo in particular is interesting because it includes the display assembly paired with a front panel for the device, revealing that the display is mounted upside down compared to previous iPhone models. The iPhone’s display and digitizer flex cables have traditionally come from the top edge of the display, routing toward connectors in the top portion of the iPhone’s main logic board. The 3D Touch chip built into the display assembly on the iPhone 6s and 6s Plus is also located near the top of that display. 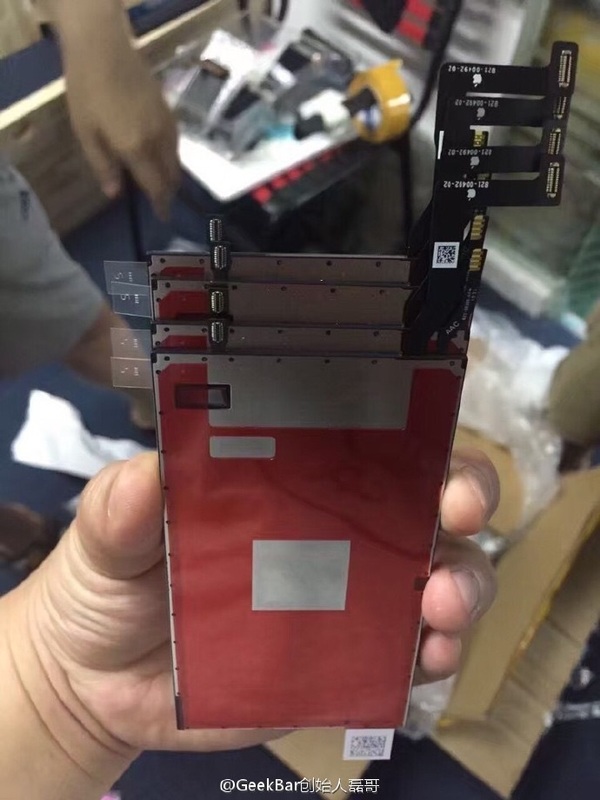 When the bare logic board for the iPhone 7 surfaced earlier this week, one notable change was that the main A10 chip had been shifted higher on the board than corresponding chips on other iPhones, and several of the usual display-related connectors were not in their typical locations. Instead, there were extra spots for flex cable connectors found near the bottom of the iPhone 7 logic board, and today’s display assembly photo shows a corresponding change to the display part. Several other sites reporting on these photos today have been looking at the part upside down and noting that the “bottom” portion of the display appears different with no cutout for the home button, potentially supporting rumors of a flush, Force Touch home button integrated into the front panel. What these sites are looking at as the home button area is actually the top of the part with the earpiece and camera and sensor holes. 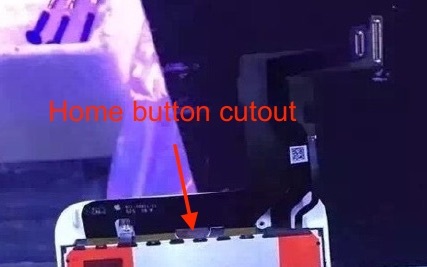 With the reversed orientation of the display assembly on the front panel, the home button would be at the top of the photo and a portion of the home button cutout can indeed be seen under the flex cable. The presence of a cutout does not necessarily mean the home button won’t have Force Touch haptic feedback as rumored, however, as the functionality could still be included in a separate home button component attached in much the same way as on previous iPhones. The iPhone 7 is expected to be unveiled at a media event tentatively scheduled for Wednesday, September 7, with pre-orders reportedly beginning on September 9 and a launch following on September 16.